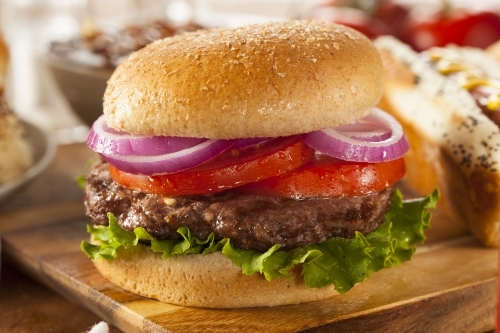 This Italian Style Burgers recipe is just in time for the grill. This recipe is just one of many Italian recipes that I’ll include throughout the summer for your favorite family barbeques. It’s pretty much that time of year here in Chicago where you get the coals fired up and ready for some great Italian meals made right off your grill. Though weather has never stopped me from barbequing. On occasion we’ve had three inches of snow on the ground and I would still be outside grilling like a fool. Usually it’s a turkey on Thanksgiving or sometimes I’ll throw a beef tenderloin on for Christmas. The neighbors think I’m crazy but there‘s nothing better than barbequing when the wind chill is below zero. Anyway, since it’s almost summertime here we don’t have to worry about the wind chill and these hamburgers are just the thing to start the season off right. 1/2 pound of hot or mild Italian sausage removed from casing. Mix all the hamburger ingredients in a medium sized bowl. Shape into burger shaped patties. Place directly on grill for 10 minutes. Turn once and grill the other side for 10 more minutes. Top with provolone cheese until melted, about 1 minute. Remove burgers and toast the foccacio face side down for I minute or you can use regular hamburger buns. Top with sliced onion, tomato, roasted red peppers and fresh basil leaves. You may top with other favorites but it’s delicious just like this. Serves 8.